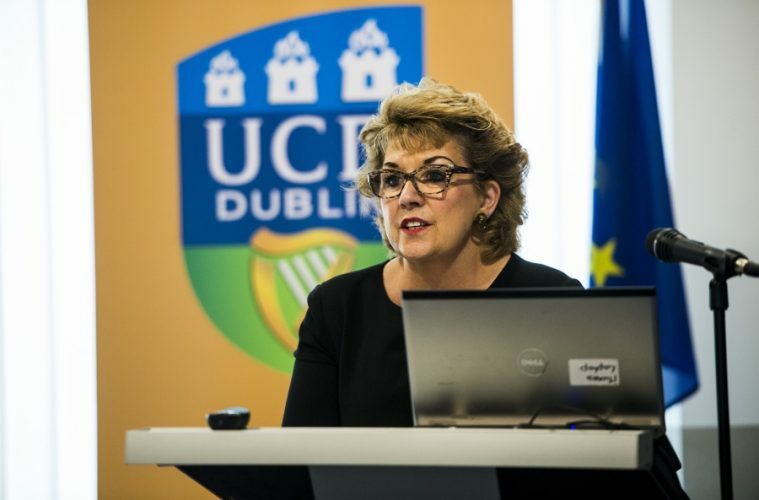 Pictured in Brussels at the UCD event entitled ‘The Contribution of EU Research and Innovation to the UN SDGs’ is Ambassador Geraldine Byrne Nason, Ireland’s Permanent Representative to the United Nations. (Photographer, Michael Chia). University College Dublin (UCD) together with Ireland’s Permanent Representative to the United Nations, Ambassador Geraldine Byrne Nason, have held an event in Brussels to explore the potential for new joint EU-UN mechanisms to enable a substantial global response to the UN Sustainable Development Goals (SDGs) agenda, especially in the area of agri-food. The event entitled “The Contribution of EU Research and Innovation to the UN SDGs” was held as part of the UCD’s ongoing dialogue with policy-makers and stakeholders to frame agriculture, nutrition and sustainability research priorities for Horizon Europe, the next European Framework Programme for Research and Innovation. The EU Framework Programmes have had a tradition of focusing on global challenges over the last decade and will now embrace the UN’s SDGs which have the specific objectives of ending poverty, reducing inequalities and protecting the environment. Among those attending the event were representatives from a large number of African Embassies to EU, officials from the European Commission’s Directorate-General for International Cooperation and Development and Directorate-General Research and Innovation, MEPs, including Irish MEPs; Deirdre Clune, Brian Hayes, Sean Kelly and Matt Carthy. Ireland has established a reputation as a global leader on issues of nutrition and food security which are central to the SDG agenda. The Agri-food/Agri-business sector is Ireland’s largest indigenous industry, employing over 170,000 people with an annual turnover of €26 billion. UCD is leading research and innovation in this sector and at UCD world-class scientists lead a portfolio of initiatives, in partnership with industry, to create safe, sustainable and novel foods that promote human health and well-being leveraging the latest data and processing technologies. Other speakers at the event included; Dr Patrick Gomes, Secretary General of the Afro-Caribbean Pacific Group of States, Linda McAvan MEP, Chairperson of the European Parliament’s Development Committee, Oana Neagu, Director General Affairs, COPA-COGECA, the umbrella organisation for EU farming and co-operative associations.